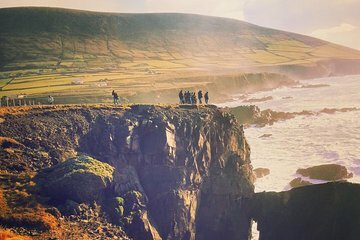 Explore coastal trails over windswept cliffs and discover the best of Ireland’s County Kerry on this full-day Dingle discovery tour from Killarney. Follow your guide along Inch Strand Beach and the Suiloid na Cille walking route, and visit landmarks including Minard Castle, the Fairy Tree and the Gallarus Oratory. Take the Slea Head road to Dingle and soak up panoramic views over the spectacular coastal scenery. Enjoy free time to explore the town of Dingle at your leisure, then travel the famous Connor Pass — Ireland’s highest road — back to Killarney.